The greatest thing about being an Amazon seller is the fact that you can manage and direct your own business that spans the globe- from the comfort of your own computer. The fact that you can actually run a business like this is truly miraculous. However this new way of operating a business is not without its challenges. The fact that you can do everything from your computer means that you have to do everything using your computer! Now what exactly is the problem with that? It is a well-established fact in the business world that your ability to handle people has an enormous impact on how successful you become. There are some who go as far as to claim that it is impossible to succeed in anything without learning how to handle people first, they might be right. We’ve all heard how important it is to have a firm handshake, or to stand up straight to project confidence while at a business meeting or a job interview. It all points to the reality that the interactions we have and how we act will have an impact on the outcome of our endeavors. In other words, presenting mere facts and numbers is not all there is to running a business or negotiating a deal. You might be thinking that since the reality of running your Amazon FBA business is the way it is, the personal human-factor doesn’t really come into play. However, you still need people to run a business, and as long as that’s the case you will need to deal with them. The good news is that investing time and effort in this area is most certainly going to pay off, possibly in ways you never even imagined. To be certain, running your Amazon FBA business doesn’t exactly require you to be a people person. There are simply not that many opportunities to build relationships. You cannot really build a relationship with FedEx or DHL, even though a shipping service is an integral part of your operation. Amazon.com and the Amazon FBA warehouses are basically giant well-oiled machines made up of robots and algorithms. Your personal approach doesn’t get you anywhere with them. 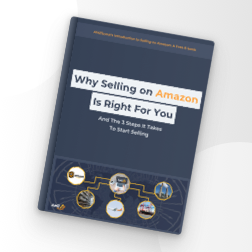 Your personal approach and your ability to handle people come into play in two areas of your Amazon business – dealing with suppliers and customers. Most of the initial stages of being an Amazon seller is comparing and studying data. You will be trying to figure out your profit margin by comparing the different MOQs (Minimum Order Quantity) and the prices per unit the various suppliers are offering as you are looking for a product. That part is very exciting; but in another, it is exhausting especially if you think how high the stakes are. At the end of the selection process you are going to make a commitment to a product and a supplier. You are going to bet your time and money on those choices – it’s a big deal. We at AMZscout are intimately familiar with the process, so much so that we have developed our Chrome extension to make the process a more pleasant experience. After all of that, you will find a product with a good profit margin, and a supplier that made a decent prototype and is willing to make it in an agreed quantity and price. At that point you will come to a realization – You really need your supplier to come through. It’s obvious all your calculations will be for nothing if your product doesn’t have the quality you need. It will all be for nothing if a new batch cannot be produced in time causing you to go out of stock or even if the labels aren’t pasted on to the packaging properly. The longer you run your business the more ways you will see how vital it is having a supplier you can rely on. It’s easy to fall into a mode of thinking that communicating with your supplier is a part of the process like any other. When in actuality it is the most important business relationship you have as an Amazon seller. This is in fact a business partnership and those are not to be taken lightly. A partnership implies trust, dependence and a common goal. It is a given that you have a common interest, the more you sell, the more units you are going to order. The more money you make, the more money your supplier makes - it’s simple. The variable that makes that partnership solid is laying the foundation from the start by putting in the effort to make sure you are on the same page. The best way of doing this is to show how committed you are to your product, which in turn tells how committed you can be to that partnership. You need to be able to paint a picture that is making a statement that you are very serious about growing your business and you will be taken seriously. It doesn’t mean that a supplier will not do a good job of manufacturing your product or making sure that it is up to a standard of quality if you do not do that. They are professionals and at this point factories are competing for your business. However, by building a relationship with your supplier a certain way, you can have them go beyond of what’s expected in order to help you. You would be surprised by just how putting in a little extra effort you can come to an agreement when it comes to anything. Keep in mind a partnership is a two way street and the best way to build a good relationship with your supplier is to never lose sight of that fact. You must never be in a mindset where you think you and your supplier have opposing interests, that is not only unproductive, it is untrue. You might be thinking that it is in his interest to charge you as much as they can per unit of a product while yours is the opposite. That might seem true, but only superficially, if both you and your supplier are focused on the long-term you will not have this issue. The mutual overall goal is to sell as many units of the product that your supplier manufactures and you sell on Amazon. The more you sell the more your supplier will manufacture. By keeping this goal in mind you can negotiate on a price where you are both making a profit and you are not putting your mutual long term goal in jeopardy. If you are both not thinking in terms of Win-Win, you don’t have a solid partnership. There will be many situations where your supplier can be your saving grace. You might be for example, having a branding issue with Amazon and your supplier will go above and beyond to provide all the documentation you need to present to Amazon. You might need a new batch of your product to be made immediately while you have to wait for 1 week in order to transfer the funds in order to pay your supplier. If you have a god relationship they will start making it knowing you will make the payment. You might find a new payment method or you want to propose a new way of changing some aspect in which you do business and they will agree to it. Be polite – This is an easy one, it’s basic human decency. Simply by saying please and thank you can go a long way simply because way too many people don’t practice it. Don’t make demands or threats – This relates to the previous one, the tone you use can make a big difference. Simply by saying “I would like you to do…because of…” instead of “You have to…or else…” is a difference between being easy to work with or difficult to work with, you don’t want to be the latter. Always consider the other side – Never try to conduct your business where you benefit at the expense of your supplier, always try to see things from their perspective. As mentioned before, always try to find a Win-Win solution. Always keep your end of the bargain – Nothing can undermine a business relationship more than a lack of trust. When you agree on something you have to honor it 100% of the time. Otherwise you cannot expect the other side to do the same. Without that level of trust you cannot expect to have a productive business relationship in the long term. Address every issue immediately – If you have a problem with your supplier, don’t wait for it to become a bigger one. If your supplier makes a mistake and you don’t say anything it’s your fault if it happens again. Only make sure to have a delicate approach handling it. Provide positive feedback – If everything is going well make sure your supplier knows how happy you are that is the case. If they do something well, make sure you praise them, it creates a great cooperative atmosphere. Or simply tell them from time to time that they are doing an excellent job even if all they do is what is expected of them. These types of feedback help to make sure it stays that way. A little gesture now and again - Sending an e-mail wishing happy holidays. Might seem like small thing but it is in fact a solid business practice. This can go a long way especially if you do that for your suppliers that are most likely form a foreign culture to your own. Wishing a Happy Chinese New Year or the Indian Diwali festival can be a nice personal touch that will always be appreciated. P.S. The Chinese New Year is on February 16th, it’s the year of the dog.